One day, you’re just moving through life with everyone else in your office or at your church, and then, for whatever reason, the reality of how tenuous our current lifestyle is, hits you squarely between the eyes. You realize that electricity and grocery stores and transportation are all things that you’ve been taking for granted and that these things could actually disappear. Maybe you’re concerned about a natural disaster. Perhaps you saw something on the evening news. It could even be a job loss that puts these things out of reach. But whatever the reason, suddenly, you know in your heart that you need to prepare for a different type of future, just in case. Where on earth do you even start with something like that? Before you start making enormous purchases or moving your family to a bunker, take some time to learn. That is the key that unlocks the door to preparedness. When you begin reading websites about prepping, sometimes it can be overwhelming. You see people talking about their one-year food supplies, their bug-out lodges, their ammo collection, and their homestead that is so far out in the wilderness that they have to climb a big pine tree on top of the mountain to get an internet connection (where they then boast online about their seclusion on a prepper forum). Getting started does not require a $20,000 investment or your children feverishly packing beans and rice into Ziplock bags late into the night. It requires enough information to properly assess your situation. It requires some guidance to help you develop a plan to keep your family safe, housed, and fed, regardless of what comes in the future. So I want you to do three things. First, bookmark some websites. Second, begin building your preparedness library with books. Finally, create your own reference book from the information you’re collecting. The next step is to create a preparedness binder. If you use a 3 ring binder (swipe your kid’s school binder from last year for a freebie), you can print information from your favorite websites and keep it in the binder for future reference. You should also make your own section, with notes, lists, important phone numbers, and addresses. Add something with pockets to keep photocopies of ID, insurance documents, and physical maps in case GPS is not working. Keep this in a safe, accessible place. In the event that you have to bug out, you should be able to grab this and take it with you. 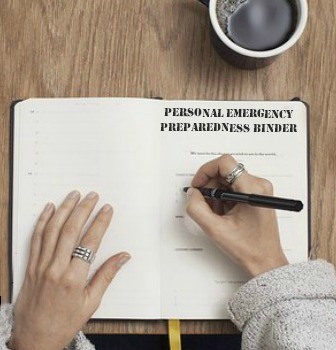 Some people keep a second copy of the binder in their vehicle with them, in case disaster strikes when they’re away from home. If you do this, consider excluding your personal information from the travel binder, in case it gets stolen. Start reading. Do all of the plotting and planning, and then put your plans into action as your budget allows. Whatever you do, stop waiting around. Disasters won’t wait until it’s a convenient time for you. 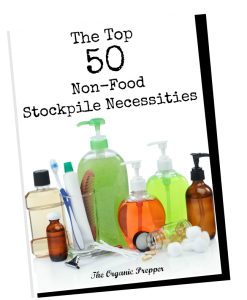 If you have been at this for a while, please share your experience with newbie preppers in the comments below. If you have friends and loved ones you’d like to help get started, send them this article to start them on their journey. Help encourage people to join our community of self-reliance! By turning neighbors and loved ones into allies, you’re building a team instead of burdening yourself with added responsibilities, or worse, having to turn them away later when they’re desperate.